Connecting to the line-level audio input in the ANAN radios can be a challenge. Line-level Audio can only be connected via the DB-25 connector on the ANAN rear panel. Besides the barely workable nature of making multiple connections to a single DB-25, the problem is greatly compounded by the rear panel jack being mounted behind a 1/8" thick rear panel. The connector Apache used was designed for mounting behind very thin sheet metal. As a result, the two threaded hex studs that provide securing, combined with the thick panel, act to limit the insertion depth. The result is that many ANAN users experience intermittent connection with the DB-25. 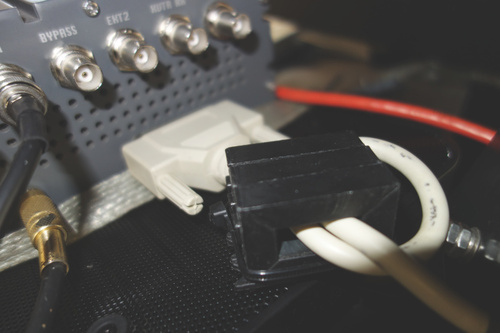 If you want to use the DB-25 you must either carefully select a male connector that will work despite the decreased insertion depth or else modify the hex studs on the rear panel. K1KW's advice: "What I did was to cut the height of those two hex studs by 3/32" on my lathe but if you are careful, I suppose you could file them down. I'd take them off the 100D and mount them in a vise to do that. You may need to shorten the holding screws in the mating connector since the longer screws may hit the bottom of the threaded studs before the connector is fully clamped down." What I (N1EU) found was that my homebrew DB-25 breakout box worked fine on an ANAN-200D but was very intermittent on an older ANAN-100D, although the stud height was the same. I found a computer DB-25 cable and cut off one end with a short length of cable and wired that into my breakout box - this connector with thumb screws worked reliably, but I was stuck with an incomplete (and unalterable) set of pin connections. The ANAN is highly susceptible to RFI and the DB25 cable is probably where it's most vulnerable. I highly recommend adding some clamp-on ferrites to the DB25 cable. The ferrites below immediately cured my TX Audio being heard in my headphones (MON off) on 80/40M. Line-in Audio from external audio equipment or your soundcard is connected to DB25-12. Analog ground is available on DB25-21 and DB25-25. The analog ground connections run internally through the ribbon cable directly to the Hermes/Angelia/Orion boards. The shell of the DB25 connector is at chassis ground, but should not be used for unbalanced (two-wire) audio connections. If you're unable to run a balanced audio line, you can try running an unbalanced connection to DB25-12 and DB25-21/25. Unless you're station and computer are optimally grounded, you will hear 60hz hum from ground loops. As a last option, you can run your unbalanced line-in audio through an isolation transformer (e.g. Bourns LM-NP-1001-B1) to DB25-12 and DB25-21/25. Note, per K1KW: In AM mode, do not run your audio through an isolation xfmr if you are using processed audio that has had limiting or clipping applied to it. The transformer can not handle the sub sonic low frequency component of the limited waveform. It will cause the the waveform to "tilt" across the top and produce a peak at the leading edge of the waveform that increases the peak to average ratio and as a result reduces audio density.